What does AOL stand for? What does AOL mean? This page is about the various possible meanings of the acronym, abbreviation, shorthand or slang term: AOL. AOL Inc. is a multinational mass media corporation based in New York City that develops, grows, and invests in brands and web sites. The company's business spans digital distribution of content, products, and services, which it offers to consumers, publishers, and advertisers. Founded in 1985 as Quantum Computer Services, an online services company by Jim Kimsey from the remnants of Control Video Corporation, AOL has franchised its services to companies in several nations around the world or set up international versions of its services. AOL is headquartered at 770 Broadway in New York but has many offices in cities throughout North America. Its global offices include Bangalore, India; Dreieich, Germany; Dublin, Ireland; London, United Kingdom; and Tel Aviv, Israel. As of October 2012, it serves 2.9 million paid and free domestic subscribers. AOL is best known for its online software suite, also called AOL, that allowed customers to access the world's largest "walled garden" online community and eventually reach out to the Internet as a whole. At its peak, AOL's membership was over 30 million members worldwide, most of whom accessed the AOL service through the AOL software suite. AOL was ranked fourth in a 2007 USA Today retrospective on the 25 events that shaped the first 25 years of the Internet and was named to the ".com 25" by a panel of Silicon Valley influencers on the occasion of the same anniversary. 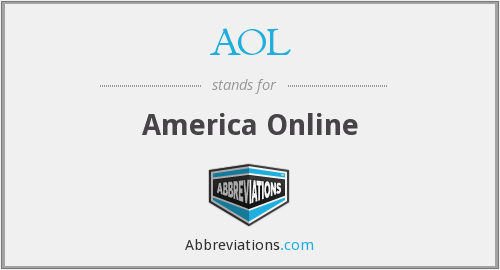 Couldn't find the full form or full meaning of AOL? Know what is AOL? Got another good explanation for AOL? Don't keep it to yourself! "AOL." Abbreviations.com. STANDS4 LLC, 2019. Web. 20 Apr. 2019. <https://www.abbreviations.com/AOL>.